What’s more, some banks and franchisors have put the SBLA program to questionable use during foreclosure actions against franchisees, says one former owner who has been through the process. When a bank calls a loan against a non-performing franchisee, the 90% guarantee effectively relieves the bank’s receiver from trying to get the best possible value while disposing of the owner’s assets. With most of the loan covered by the Canadian taxpayer, the assets – fixtures, kitchen equipment, inventory, etc. – can be sold quickly at a deep discount, possibly below market value. This allows the franchisor too step in and buy back the property at better-than-firesale prices, thus generating a windfall profit when the store is later re-sold to another franchisee. Prentice Hall Canada Inc., 1995, p. 94 to 101. Canadian bankers, ever sensitive about their reputations for cautiousness, sometimes describe themselves as true entrepreneurs who happen to be encased inside immutable bureaucracies. Mostly, that’s wishful thinking. But Jim Holloway, it quickly becomes apparent, is not your garden-variety banker. Loose-limbed and restless, he doesn’t want to meet in his office, preferring the livelier milieu of an up-scale café in the mall downstairs, where he can chain smoke his John Player Specials, guzzle mug after mug of gourmet coffee and gleefully regale a visitor with gossipy tales from the far side of Canadian franchise banking. Franchise banking, Holloway explains, is a big, profitable deal for Canadian banks. Unlike the comparatively risky loans to be made in, say, commercial real estate, the lucrative franchise market has generated a low-risk, high-volume business, even during the recession. For instance, the Canadian Imperial Bank of Commerce, which leads the pack in franchise lending, has a whopping $10 billion in its franchise loan portfolio, and saw the dollar volume climb a remarkable 16% between 1992 and 1993, neither of which were economically dynamic years. The typical annual default rate is tiny – a couple of basis points (one basis point equals one-hundredth of a percent) compared to 50 – 100 basis points for independent businesses. Holloway and his counterparts at the other big banks compete vigorously for this burgeoning business, all trying to position themselves as the lender of choice when the next big franchise concept burst onto the market. What they all know is this: When a franchise well starts gushing, the loan dollars and service fee revenues will flow prodigiously. In other words, it doesn’t much matter what the local branch officer knows about a particular chain. It could be very little, in fact. As long as the franchisor selects owners who meet the financial criteria set out in the program, the chances are “better than 90%” th5at they will be approved for a loan, says Holloway. Any deviation, and the branch manager must notify head office to await further instructions. Holloway calls this a “turnkey banking package,” and if the underlying principles – standard formulas, rapid distribution into diverse markets, discounts centralized decision-making – seem all familiar, that’s no accident. Call it learning something from the client. Franchise lending wasn’t always this easy. As franchisees in some of the older retail chains like Home Hardware will recall, reluctant Canadian lenders had to be dragged into franchising in the mid-1970s. Until then, despite the heady boom in franchising south of the border during the 1960s, Canadian banks regarded franchisors with considerable skepticism. Lenders provided some credit to franchise systems, recalls Dennis Warne, a senior loans manager for the Federal Business Development Bank (a Crown corporation), but the banks didn’t know what to think about franchisees, who needed the financing to buy equipment and inventory. Here were small-business loan applications in which the borrowers had no receivables and the franchisors’ only cash flow cam from tiny, non-arm’s-length companies whose owners wanted to generate sales by renting someone else’s trademark, of all things. “The chartered banks really didn’t know how to do them,” Warne says. Instead, the FBDB – a project lender of last resort – jumped into the franchise business in the mid-1970s and eventually backed five chains: three in fast food, two in retail. (Four are still in business.) For the FBDB managers like Warne, this kind of lending was very much terra incognita: They visited stores, pored over operating manuals and investigated training systems. More important, the FBDB managers scrutinized the chain’s income statements to figure out whether a franchisor’s cash flow included revenue drawn from sources other than franchise fees. It’s an investor due-diligence strategy still in use today. In 1975, one of the big six banks – the Royal Bank of Canada – took what turned out to be a pivotal step in the history of Canadian franchising. It hired a man by the name of Dino Pappas, a marketing executive with a shoe retailer, to teach the bankers a thing or two about franchising. The RBC deliberately chose a non-banker because no one inside the bank knew this new type of business. What the bank did have, on the other hand, was a motive to learn. As it happened, two large Royal borrowers, both do-it-yourself chains, had been pressing the bank to approve loans for their dealers, and do it in a systematic way. After all, the chains were expanding according to a formula, so why couldn’t the bank follow suit? Pappas set out to explain how retail chains works, with an eye to developing a standardized lending program for all new outlets and the franchisees who owned them. Pappas, says Ben De Castro, Holloway’s counterpart at the Royal, “gave the bank a lesson in licensing and distribution.” But the resulting lending strategy, says Holloway, seemed “radical” because it appeared, on one level, to violate the sanctity of a key banking commandment: “Thou shalt not pre-approve loans.” The bankers, he continues, “had to get their head around the idea” that a McDonald’s is a McDonald’s, regardless of where it happens to be sitting. Slowly, the RBC’s bankers began talking to fast-food franchisors and retail chains, and soon developed contacts among the Toronto head offices of the U.S. systems moving into Canada (at the time, U.S. chains would typically set up first in Ontario to test the Canadian market, and expand from there). Within months, most of the big banks had set up their own franchise lending operations, and the race to grab clients was on. By the late 1980s, the copious lending started to tail off in anticipation of the downturn. In 1989 – a year before the recession began – the CIBC registered its worst-ever default rate for its franchise loan portfolio – 22 basis points. The collapse in the residential real estate market exacted a further toll on franchise unit sales, because the depressed value of homes reduced the amount of collateral prospective franchisees could put up against loans. 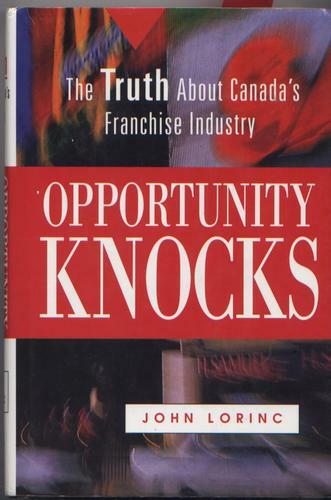 Coincidentally, adds Castelane, many of the franchise systems which got off to a roaring start in the early 1980s entered the recession just as the founding entrepreneurs were beginning to lose control over their fast-growing empires. “It took a number of years for franchisors to reach this critical mass and that coincided with the recession,” she explains. In the mellow 1990s, the banks claim – not always ingenuously – that they have become more cautious about franchisors. For national programs, bankers target chains with 25 to 75 units, clean balance sheets, a decent amount of equity and, most important, the ability to generate a steady stream of loan business. One franchise banker says a chain which can’t guarantee $5 million in new franchise loans each year – the equivalent of abut 20 to 40 new units – won’t qualify for a program. Franchisors are also encouraged to screen franchisees more carefully. For chains that don’t make the cut, banks will offer franchisee loans, but on a case-by-case basis. Holloway will also watch for red flags such as a franchisor that doesn’t have any corporate stores or a U.S. chain expanding north of the border by means of a “Russian roulette clause” (i.e., the Canadian master franchisee has to peddle a certain number of units by a particular date of lose the rights). Ironically, though, a federal government loan subsidy has prompted the banks to open the floodgates in their franchise programs. Ottawa has run something called the Small Business Loans Administration since the early 1960s. Its purpose, ostensibly, was to guarantee fixed-asset bank loans of up to $100,000 for small businesses (the government reimburses the lender for up to 85% of the value of the loan in the event of a default by the borrower). The program was initially successful, but its popularity trailed off after the mid-1980s because the banks felt Ottawa was being too finicky about paying out claims. Then, when Canada’s small-business lobby began to complain about the lack of bank financing, the former Tory government instituted a big change in the SBLA. As of April 1993, the ceiling on loans rose to $250,000, more businesses were included (the limit on eligible company size was raised from $2 million to $5 million in annual sales), and the government jacked its guarantee rate from 85% to 90%. The new rules sparked a lending rush, as is often the case when bankers find themselves relieved of most of the risk involved in lending capital. Suddenly, a program which had attracted less than half a billion in loans annually became very popular. In 1994 alone, financial institutions signed off on some $3.5 billion in small-business loans guaranteed by the SBLA. Part of the reason was the pent-up demand from the recession had finally been satisfied. But many Canadian bankers – fed up with taking the blame for the undercapitalized plight of small business – were only too happy to start writing SBLA loans. Indeed, a review of the updated program revealed that up to 59% of the SBLA loans approved since 1993 were made at a banker’s suggestion. Until the government moved to tighten the rules in early spring 1995, the revamped program drew in loan applications from a wide range of businesses, many of which turned out to be franchises. Franchisors talk up the SBLA program in their sales presentations, to persuade prospective investors that franchise loans are easily obtained. So, despite the fact that lenders like Holloway and Scrivener regard franchise financing as an almost sure bet, the country’s banks jumped on the SBLA bandwagon – in essence, shifting the risk of franchise investments onto the taxpayers’ shoulders. The banks won’t reveal the precise amount of SBLA lending they’ve been doing, but Doug Melville, director of financial services policy for the Canadian Bankers Association, confirms there is “a lot of franchise financing going on” under the SBLA. Whether franchises should qualify for this kind of subsidy is an open question. On one hand, a typical franchisee, regardless of the system, puts up his or her own money and therefore incurs the risk on the investment. On the other hand, many franchisees are not truly small businesses, because they enjoy the kind of training, marketing support and purchasing power accessible only to much larger enterprises. Furthermore, lenders in Canada have long touted the safety of franchise lending. But if it’s so safe, why do the banks need to write SBLA loans, which intended, primarily, to help riskier, independent businesses?